I was challenged on Facebook to do the Artchain - 5 days of art. So here is Day 5 - a new card showcasing Oak House Studio's new Triple Colour Pigment Ink Pads and the Sunshine sentiment & Texture set of stamps. They're going to be featured in the next Craft Stamper magazine (along with the Double Daisy) and as I seem to have 2 sets, then I'm putting one set in the GIVEAWAY. I've used the Triple Sunshine Yellows and Triple Fruity Reds ink pads with a square palette stamp and just inked, kissed and stamped with the Texture stamps. I can assure you it's an addictive technique. I've just matted it all on maroon card and added the sentiment to finish. For the rest of my pieces, I've gone back through my archives starting with some scrapbooking - a very early double page from 2004. I'd do it differently now but it still reminds me of how windy it was. You could barely walk along the prom and our voices just disappeared into the air. I really need to start scrapbooking again and not leave all my photos hiding in my computer!! Next are a couple of baubles made at a workshop about 8years ago and I still love them now. They were so easy to make - clear baubles, add some polished pigments, shake, add another colour, shake ...... the colours are wonderful and I need to do this again too!! 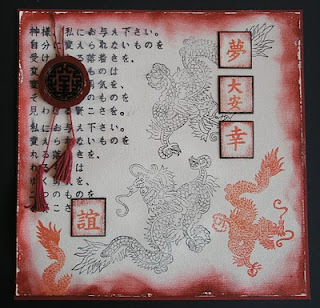 I made this canvas in February 2010 for Oak House Studio's stand at Stitches (the Trade Show) - the theme was red and black and I used a selection of the Oriental and Dragon stamps. It was fun to do, much admired and Suze Miller Weinberg even took a photo and blogged about it. And finally my last project made for Oak House Studio's ONE STAMP weekend using the Decorative Diamond stamp and Ice Resin. It came out much better than I expected so I sent a photo to Craft Stamper magazine - they loved it, asked me to write up the project and amazingly it was published in the September 2013 issue. I love how varied my projects are and it's made me realise how stuck in a rut I am. So that's my 2015 challenge to have a go at different things more. Hope you like my projects and don't forget to leave a comment for your chance to win some stamps! !